Since April, Native American activists and environmentalists have been protesting the Dakota Access Pipeline (DAPL), which would run nearly 1,172 miles and carry over half a million barrels of crude oil a day from the Bakken Oil Fields in North Dakota to refineries in Pataoka, Illinois. A part of this $3.8 billion pipeline is proposed to be built underneath the Missouri River, a water source for millions of people that is near the Standing Rock Sioux reservation in North Dakota. Just outside Cannon Ball, North Dakota is where a center of spiritual and cultural opposition to DAPL, Sacred Stone Camp, is located. The name of the spirit camp is a reference to “Sacred Rock,” which is English translation of Iŋyaŋ Wakháŋagapi Othí, the original name of the area. Though the DAPL would run through treaty lands and potentially desecrate hundreds of archaeological sites that are significant for Native American populations, there was no consultation of tribal leadership by the company trying to building the pipeline, Energy Transfer, and the project was still approved by the U.S. Army Corp of Engineers. The threat to water and the larger environment is real. There have been over fifty oil pipeline accidents in the U.S. in the past two years alone, which led to spills, a few deaths, several injuries and destruction of water and wildlife, not to mention the release of toxic, flammable chemicals and carcinogens into the ground, air and water. For seeking to protect their land and resources, the water protectors at Standing Rock have endured intimidation and harassment by Energy Transfer’s private security and police; dozens of arrests; violent attacks with dogs and pepper spray; removal of their water supply; and intentional destruction of burial sites, prayer sites and culturally significant artifacts—the last of which prompted North Dakota’s Standing Rock Sioux to file a temporary restraining order that is currently halting DAPL construction in the area. It is not a reach to consider the actions of the Energy Transfer and the U.S. government as a continuation of genocidal practices against Native American people. This past weekend, tribal member and activist Linda Black Elk posted a statement on the repressive and destructive tactics used against those at Sacred Stone Camp (excerpt). …Today, barely 24 hours after [restraining order] papers were filed, Dakota Access used bulldozers to destroy those sites. It was absolute destruction. They literally bulldozed the ancestors right out of the ground, along with destroying tipi rings and cairns. They did all of this while assaulting peaceful resistors using vicious dogs, tear gas, and pepper spray. There’s only one conclusion: they are attempting to provoke us to violence. They learned exactly how to hurt us the most and then they threw it all in our faces. They were smiling and laughing the whole time…evil grins on their faces as their dogs tore in to peaceful water protectors. It is one of the saddest and most shocking things I have ever seen. Please tell the world what is happening. Though mainstream media coverage has been sparse and skewed at best, as these abuses come to light, more people across the country are becoming aware and joining the cause, which is now considered to be the largest Native American led protests in U.S. history and includes people from over a hundred tribes. 1. Local artist, organizer and educator, Amara Betty, was overwhelmed with support before heading to North Dakota in early September with a full truck of supplies that had been donated by folks in Pilsen and the large Chicago community. She will be making another trip to ND in November; if you’d like to communicate and stay informed on that trip’s progress, follow Red Warrior Camp. 3. Contribute to the Sacred Stone Camp Legal Defense Fund, a separate fund that goes directly to legal costs for the folks resisting active construction of DAPL. 4. Contribute to the Sacred Stone Camp GoFundMe, which goes to operational costs of the site. 5. 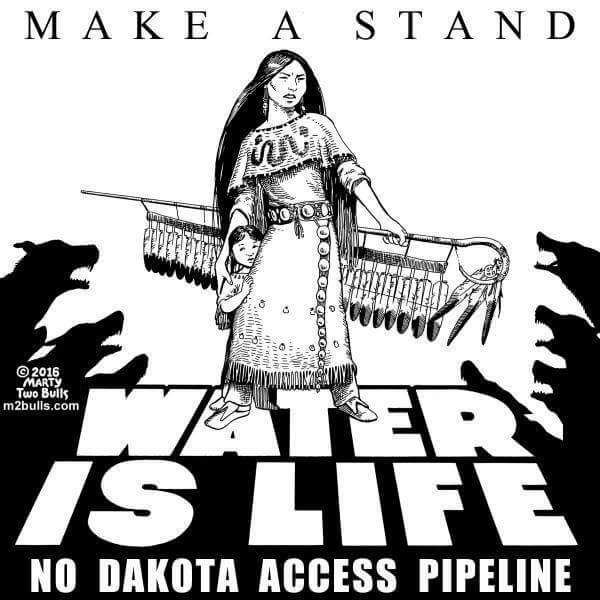 Donate to support the Standing Rock Sioux at their website, by clicking the Donate the DAPL Fund link. 10. This Friday in Chicago, there will be a rally in Daley Plaza from 4-6pm, in solidarity with Standing Rock Sioux and the Sacred Stone Camp. You can also participate in the planning of the rally tomorrow at the American Indian Center- Chicago. 11. This Thursday in Chicago, there will be a Brown & Black Power Hold Vigil event downtown in support of #NoDAPL, which is organized by Lifted Voices and Black Lives Matter: Chicago. More details can be found here. 12. Sign the petition to the White House to Stop DAPL, or sign the petition directed specifically to President Obama. Water protectors have asked for global acts of solidarity between Sept. 3 and 17. We encourage our readers to partake in or organize local acts of solidarity with the DAPL protestors. To stay updated, follow the hashtags in Linda Black Elk’s quote above, your local NoDAPL-related groups, Sacred Stone Camp social media, and Native American media outlets. Also, check out the NoDAPL zine for further background on this movement. This list was compiled in large part with information being circulated on social media. UPDATED 9/7/16: add vigil event in the last section; edit final paragraph. UPDATED 9/13/16: provide update and edit contact info in the first point.